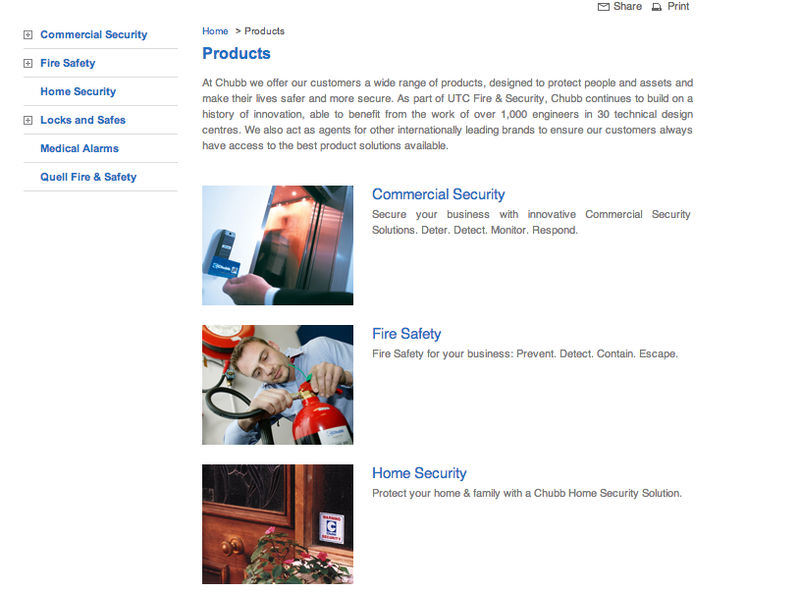 The Chubb fire protection products page has high usability. Information is displayed neatly with possibly a grid underlay to keep the information structured and unified. Both the headings and the images are hyperlinked so it is easy to navigate through the page. All links are working correctly. The bottom two links take the user off-site and appropriately open in new tabs as to not lose the visitor. The navigation bar on the side expands into different categories which improves usability as specific information is easier to find. A complaint would be that there is ample white space. This is because the images are large and the font and content is so small. It may be better to have either the information stacked in two columns or perhaps increase information. Increasing information could be through additional hyperlinks within textboxes. For example, Locks and safes could link users to Commercial sales, door locks, fire resistant safes, home and office safes, hotel and hospitality safes and registered key systems just to name a few.